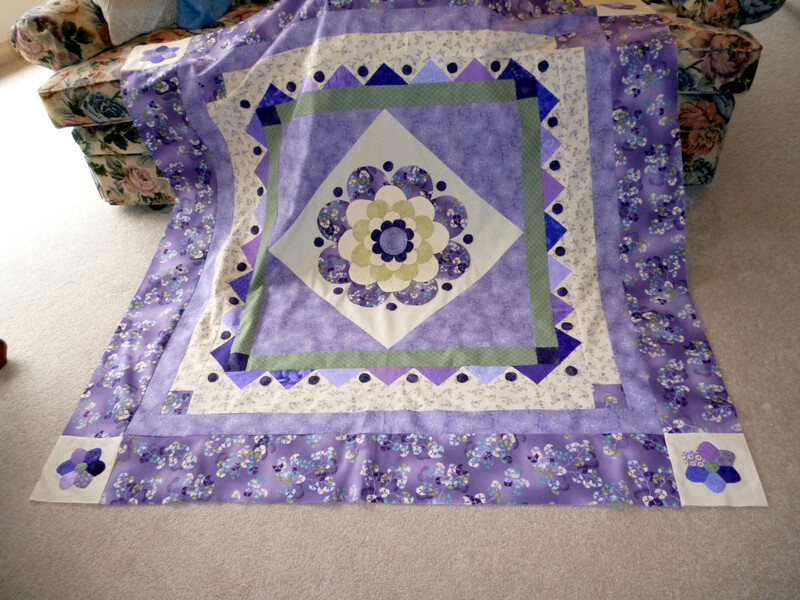 Today I added the final border to my Pretty in Purple quilt. Hopefully tomorrow I can get it ready for quilting. It is looking much more blue in this snap but it really is pretty in purple and lavender with just a touch of green, I think I might be getting used to this needle-turning business and some day may have another go at it as this time I quite enjoyed it. I've been doing plenty of reading lately. I always enjoy Ruth Rendell and her alter-ego Barbara Vine. At the moment I'm reading Asta's book and am thoroughly enjoying it as usual. But there's something about the way she introduces her characters which bamboozles me. After 50 pages I've had to go back to the beginning and use a pen and paper to make a list of he goes with her goes with he goes with her and build up a tree of family and other people. Without this as a reference I just can't make sense of the story ! Before that I found a couple of Kate Mosse books - Labyrinth and Sepulchre. It's ages since I've read one of this kind of book where a person's brain can retain traces of their forebear's history. Makes for a really good read with the story moving between the present and the past, in this case the wars of hundreds of years ago of intolerance in southern France. Have you thought about how you're going to quilt it?? I've been reading, for the first time,'Captain Corelli's Mandolin'. I saw the film ages ago but the book is so much better. It works is a love story and a war story, and I'm particularly enjoying the doctor's analysis of history. Well the quilting will be done by hand. Haven't quite worked it out yet but the open spaces will have quilting which echoes the curves of the applique in some way. I haven't read Capt C's M yet but have heard good reports of it. Looks lovely, very pretty purple fabrics. Well done on your finish. Your quilt is gorgeous, my daughter would love this quilt it is her favorite colour. I love it! Purple and green are two of my favourite colour combinations. They look so pretty together!